Here is this week’s photo prompt. I’m glad it will continue as Susan is taking over the reins for this challenge next month. Thank you! 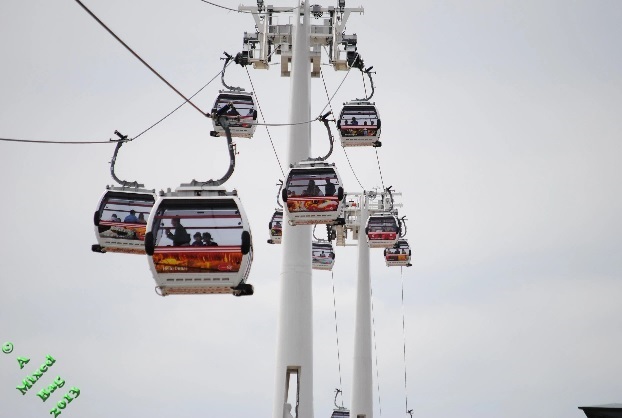 As expected with any new attraction, the cars were full and swung high above the valley taking in the most spectacular views of the landscape amid excited chatter and exclamations of wonder. The noise was deafening, and several stood up in the hope to find escape from the pods containing them, though to exit meant certain death due to the depth of the ravine below. Children were crying, women were screaming, and the men were trying to keep it all together for the sake of their families. The Beasts were coming towards them at full pelt, delirious at the thought of human meat conveniently canned before them. The occupants realised the situation was hopeless, and consoled themselves with the thought that at least they would all die together. Most families sat on the floor, holding hands or embracing each other in group hugs as they waited for the inevitable. The projectors were turned off and the pods continued to move towards their docking station. The trembling and terrified were escorted to waiting medical teams. It was doubtful the latest ride at the theme park would be continued after this. This entry was posted in blogging, Challenge, photoprompt and tagged Sunday Photo Fiction. Bookmark the permalink. Thanks Sci. With all the special effects and realism in films, I think it’s only a matter of time for something on a grand scale like this to come about. Me neither, but from my tale, I think perhaps the patrons had no idea they were going to play the part of potential lunch! I’m planning a trip to Vail Colorado this summer and want to ride one of the gondolas to the top of the mountain. This type of ride would Not be to my liking at all. Nice story. Thanks Susan. Hope you enjoy your trip! Sounds like Jurassic Park with wild roller coasters, great fun! Exactly! I think maybe a bit too realistic though. What a great piece of flash. Now if the medic’s were also projections, heaven held them. I get the feeling for a ride like this, you should have to sign some sort of waiver before being allowed to get on. I suppose if such a ride were to exist, it would be the element of surprise that you were paying for. Not the sort of thing for me I’m afraid.